Calling all geekettes and nerdettes (and yeah, the guys too)! This sunny Thursday saw the kick-off of the 2nd annual Geekgasm hunt, which promises to be a celebration of all things geeky and nerdy. In my real life, I adore geeky gadgets and all things nerdy so it was hard to decide what to make for the hunt gift. Things like ant farms, goofy eyeball glasses that sprout flowers and other ideas flitted through my head. Then I remembered one of my loved possessions from the 70s – a glowy mini lamp with mushrooms. So, here it is, for your pleasure and geeky entertainment. The hunt is on from June 23, 2011 – July 13, 2011. This entry was posted in Events, Freebies and Gifts, News on June 23, 2011 by moriko. Yay, it is the start of a brand new summery week and I have news for you guys! I made some new bendy vases with cool textures and decided to go crazy with Hibiscus. And there are lots of different ways to buy ’em, depending on how much loot you want to spend. All the individual yummy colour combinations are stuffed in a Gatcha. Play the Gatcha in the New Releases area of the store for 25L each, and get mod/transfer versions. 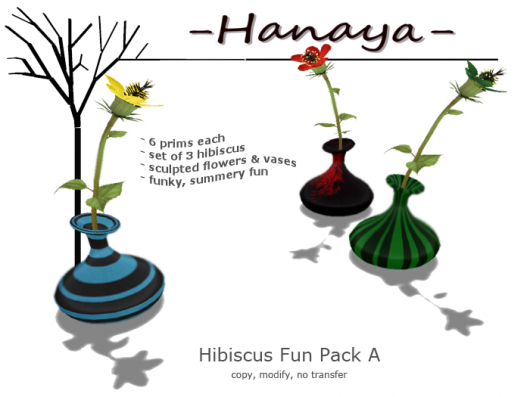 If you prefer, choose one of the 2 available fun packs, which contain 3 hibiscus each, or go big for the Hibiscus Mania Fatpack and get all 9 of them. 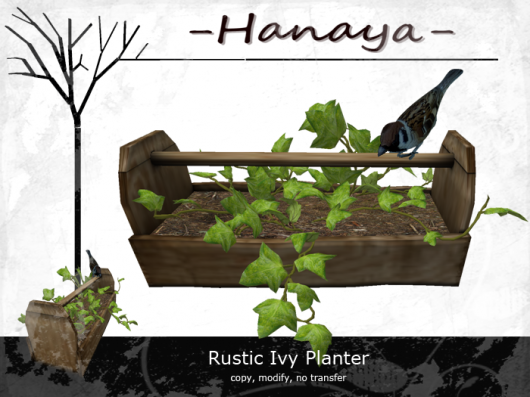 Another new release that I sneaked into the store last week is the Rustic Ivy Planter – a low prim and fit-anywhere little home or barn adornment. The new releases are rezzed at the store as usual, and will be released in our webstore on the Second Life Marketplace in a day or two. This entry was posted in Product Announcements on June 20, 2011 by moriko. I made this living room set for the Second Life home that I share with my partner, Yuukie. After posting several pictures on my Flickr of the interior of our home, some of my Flickr friends asked if they could buy the set. 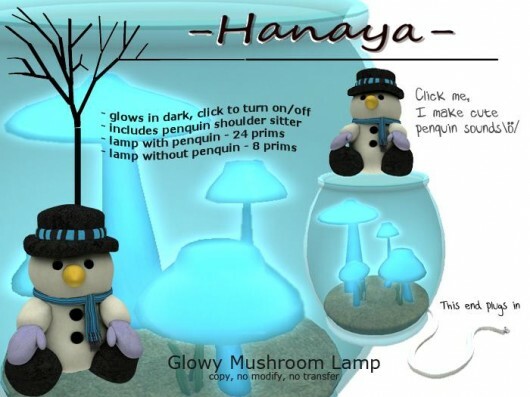 So … here it is, available at our in-world store, as well as the -Hanaya- webstore on the Second Life Marketplace. The look is completed by custom-sculpted tables and lamp made by me, a simple Gingko Leaf arrangement and hard candies in a bowl, all set on a scrunchy sea grass rug. There are a total of 10 single avatar sit/slouch animations in the set – 8 in the couch, and 2 in the chair. The sectional couch in this set also includes an MLP (v2 4z9) menu for the 12 couple animations. There are 4 ‘Relaxing’ animations, 4 ‘Cuddle’ animations and 4 ‘Kissing’ animations. Most are suitable to both hetero as well as gay/lesbian couples. All poses are adjustable via the MLP menu. The set is rezzed in our in-world store, so please feel free to come by and check it out. This entry was posted in Product Announcements on June 9, 2011 by moriko. 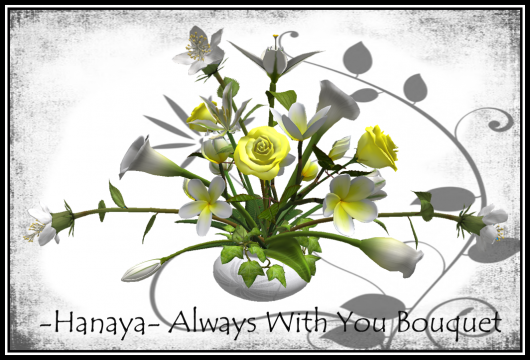 If you frequent my store, – Hanaya- Yummy Collectibles, you will know that I love hunts. My aim is to always have one hunt active at any given time. And no – it is not just to draw new customers to the store – I like seeing new people come in, and to give stuff away. But I like to be choosy in which hunts my store participates in. One of my criteria, obviously, is the hunt organizer. The other is the hunt poster and name of the hunt. The Beached Bunny Hunt, which starts on Friday, June 10th, meets both of my criteria. The TBBH organizer, Allie Munro, is super-organized person (just like me), and knows that the devil is in the details. 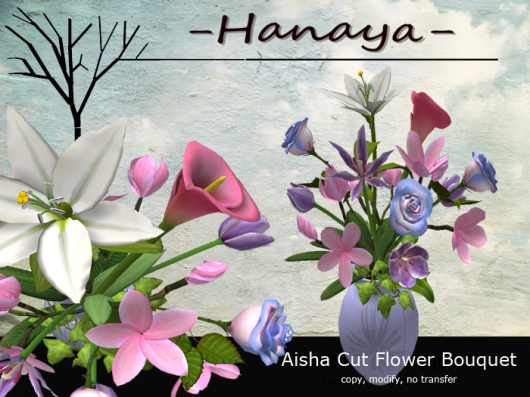 For this hunt, like previous hunts of Allie’s, -Hanaya- is both a participating vendor as well as a hunt sponsor. That means that in addition to making what I hope you will think is a cute gift (see below for image), I have also provided a gift for the grand prize at the end of the hunt. The grand prize can be claimed by any hunter who visits all the locations participating in the hunt. The set is mod/copy, with the exception of the animations and setting files, so you can arrange stuff as you like, and rez more chairs and stuff. 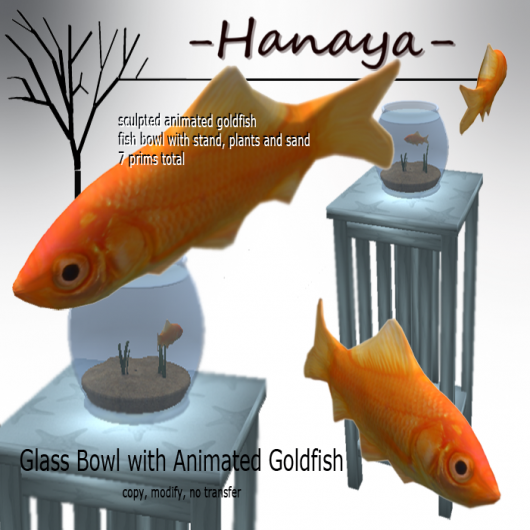 The Glass Bowl with Animated Goldfish on it’s cute Starfish Stand is -Hanaya’s- contribution to the sponsor area for the hunt grand prize. Sculpted and only 7 prims – hope you like it as much as I do! This entry was posted in Events, Freebies and Gifts, News on June 8, 2011 by moriko. It seems to me, that the longer you are in Second Life, the less you are apt to make new friends. What with being busy with making stuff, or getting seriously involved in sports or other competitive stuff, or just spending quality time with your old and dear friends and family, somehow new friends are few and far between, at least for me. But recently, I made a new friend who has the makings of a new chatty GF .. yay! I happen to know that she likes flowers, especially pink and lavender colours, so I made this bouquet and named it after her. It is available exclusively at the Designer Showcase at it’s new location in Amaradia. This entry was posted in Product Announcements on June 7, 2011 by moriko. I have been away from home for the last month, dealing with the sudden and unexpected loss of my mom. Now I am home and wish to thank you from the bottom of my heart for your IMs and notecards – they meant a lot. 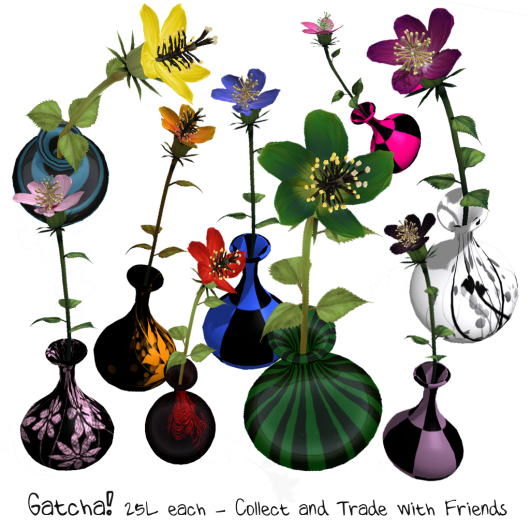 My mom was an avid gardener and nature nut – so to remember her in Second Life, I have created a special edition bouquet, which I wish to share with you all. It will be sent out on the in-world group and subscribo on June 2nd. One way to get past sad things is to keep busy – so expect lots of new releases in the coming weeks. Thank you for being part of my Second Life. This entry was posted in News on June 2, 2011 by moriko.